Today we had the first of two Reconciliation Services in school for our Yr.8 pupils. Through various media (the Gospel story of The Prodigal Son in Lk 15, a slideshow I put together last year to accompany Coldplay's "Fix You", a newspaper, the true story of Victoria Ruvolo, intercessions, a procession of light and modern Christian songs by Delirious...) we sought to help the pupils understand the need for mutual forgiveness, for reconciliation in our lives and to prepare them for the chance to receive the individual sacrament after the service for those who wished. **MORE SPOILERS**Saw it again tonight, legitimately this time! ;-) Understood and appreciated even more clearly the appropriateness of the flashbacks. Balthar doesn't completely achieve his hard-won redemption until he breaks down saying "I know farming" - his father who he hated and who we saw in an earlier flashback was himself a farmer, Baltar being brought up on a farm. In that one phrase and the tears that follow it, Baltar accepts who he truly is, but more importantly experiences reconciliation with the memory of his father.The Film Studies teacher in me has found it wonderful to see some of the younger (adult) cast seemingly grow in confidence as actors through the show's run. Tricia Helfer + Grace Park have been outstanding as the various incarnations of their respective Cylons. "Head" 6 + in the red dress and Caprica 6 have to be two of THE all-time great "femme fatales". "What do you hear, Starbuck?" "Nothing but the rain, sir." - the Battlestar Galactica finale. Apologies to those who are ignorant of the landmark sci-fi tv series that came to an end in the US last Friday (with us Brits having to wait until tomorrow - think Moses leading the Israelites to the Promised Land with the Egyptians not only hot on their tails but also infiltrated into their ranks), but this exchange between Admiral Adama (Moses figure) + crack pilot Starbuck was one of many tear-inducing moments during the 5-year long serial's finale. Tear-inducing because of the fact that these two characters (like a father + daughter) have had this same exchange at key moments since the first series and it has acted as a pointer to the complicity, mutual trust and deep affection they hold for each other, and because of the context in which it happens (can say no more for now!). 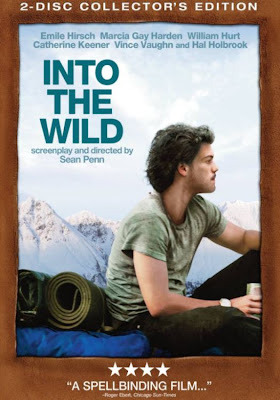 Last week I saw a film that has leaped up into my Top 30 of all-time (I have a list of about 120 in a Facebook application): "Into The Wild". It's based on the real-life story of Christopher McCandless and the book written about him by John Krakauer. McCandless was a bright, young, sociable American middle-class University graduate who turned his back on a world he no longer felt part of and parents who had deceived him, gave away his savings to OXFAM and set out on foot from West Virginia to Alaska. The film tells his (+ his family's) story: the encounters he makes on the way, his reasons for doing this, his arrival and stay in the wilds of Alaska.Brilliant direction by Sean Penn (a truly gifted film-maker), beautifully filmed and acted... a film that contains magic moments of visual and emotional poetry that have stayed with me since.See here for a detailed, appreciative New York Times review. Wow, my favourite tv series makes it all the way to the United Nations. The following article from the Chicago Tribune explains this. I do hope that when the 5-year long saga finishes in 10 days time with the airing of the final 2-hour episode it gets the critical acclaim it deserves as one of the outstanding works of science-fiction across all media of all time and as one of the top tv series of recent years, up there with The Sopranos and a few select others. Fr. Des Power in the middle with friends Jim Forsey (left) and his brother Leo (right)On Sat. March 7th I attended the birthday celebrations of Fr. Des Power together with Bro. Peter and Bro. Ed. 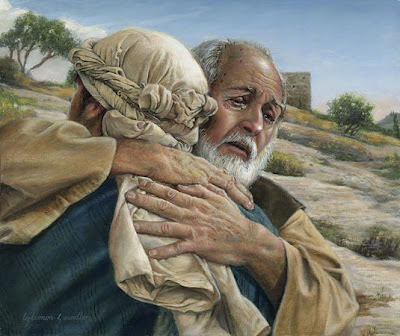 Des is a diocesan priest who used to be at one point a De La Mennais Brother. He retired from full-time ministry a few years ago and willingly helps us out in school with our Masses and other liturgies. His brother Joe is still a Brother in our order and has spent most of his active life lecturing at a De La Mennais Brothers university in America: Walsh College, Canton, Ohio.Des will occasionally drop by at our community house of an evening to join us for Evening Prayer and a bite to eat, then helping Bro. Ed with the cryptic crossword. He’s a great raconteur, an all-round lovely guy and a pleasure to be with. Anyone looking for a recording of the Stations of the Cross could do far worse than this production produced by the Redemptorists with the text read by Northern Ireland actor Liam Neeson.Read more about the recording here. The cd can be ordered form here. I'll be going to see this young Liverpool 4-piece next Saturday. Why am I publicising them? Well, 3 of the 4 are former pupils of our school and the drummer came with me on one of our De La Mennais Brothers youth gathering trips as part of our band leading the music. So I had the HONOUR of playing in a band with a future member of the soon-to-be-world-famous-and-all-conquering Fly With Vampires. Check them out here. Be sure to listen to the 2nd song on their MySpace profile Tear Dried T-Shirt which I think is rather superb.